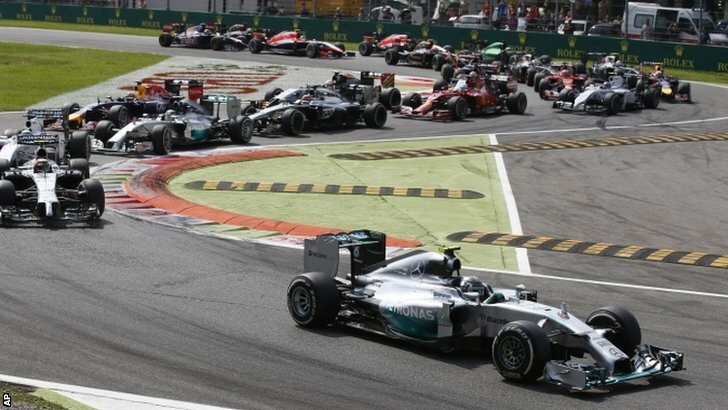 Home » Formula One: Imperious Lewis wins Italian GP after Rosberg error! 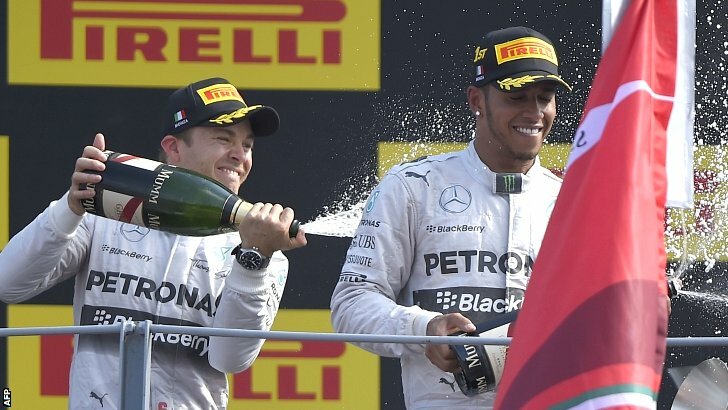 Lewis Hamilton has won the 2014 Italian Grand Prix after fight back after a lackluster start at the Autodromo Nazionale Monza. The Briton fell to 4th in the early stages before fighting back to the lead after an error from leader and team-mate Nico Rosberg handed Hamilton the position. Former Ferrari driver Felipe Massa drove a quiet but solid race to take 3rd place. Ferrari had a poor showing in their home race, with Raikkonen taking 2 points in 9th and Fernando Alonso retiring for the first time this year with an energy recovery problem. Lewis Hamilton had a shocking start from pole position and fell into the clutches of the fast starting cars of Rosberg, Magnussen and Massa. The team would later conclude that the issue was just with his race start setting as Lewis settled into 4th. Valtteri Bottas has a similarly bad start from 3rd on the grid as he fell into 10th place. Daniel Ricciardo was yet another driver to have a troublesome start after being forced to cut the first chicane on his way down to 12th. 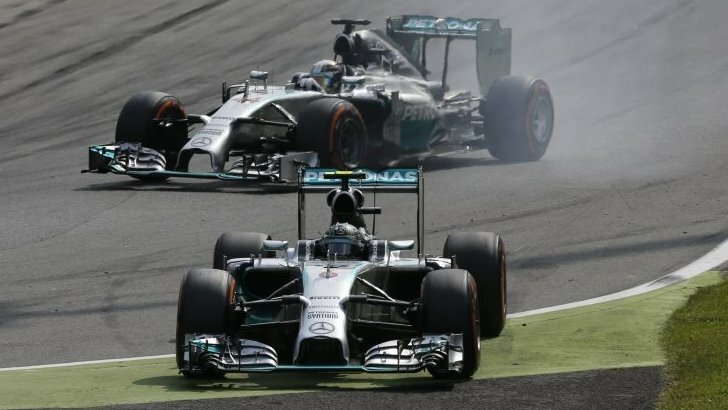 Rosberg was already pulling away from Magnussen’s McLaren, with the German pulling clear of Kevin’s DRS zone. Lewis Hamilton’s issues were resolved quickly and he soon got onto the back of Felipe Massa’s Williams for 3rd place. It was Massa that was improving his position first however as he placed himself in the slipstream of Magnussen to vault himself around the outside into 2nd. Kevin was slow out of the chicane which allowed Hamilton through to 3rd to demote the Dane further on the run into the first Lesmo. Massa set the fastest lap of the race on lap 7 and was starting to reduce the gap to leader Rosberg. The Brazilian was pulling Hamilton to the front with him. The gap further reduced on lap 9 when Rosberg locked up into turn 1 and was forced to take to the escape road slalom course. The gap was just 2 seconds now and to add further damage to Rosberg, Hamilton pulled off a fantastic move around the outside of Massa at turn 1 on the next lap to move himself up into 2nd place and now in direct pursuit of his team-mate. The next few laps saw two drivers start to charge in their respective situations. Lewis Hamilton began to cut down the gap tenth by tenth to team-mate and title rival Nico Rosberg, whilst Valtteri Bottas began to pick off drivers every lap as he sought to recover from a dreadful start. Bottas took Raikkonen, Perez, Alonso and then Button to go from 10th to 6th in 5 laps, with Hamilton taking almost a second out of Rosberg’s lead in the same duration of laps. The ideal strategy for the race was a rare 1 pit-stop after the 20 lap mark. Red Bull’s Sebastian Vettel was the unusual first stopper early on lap 19. He had been stuck behind Kevin Magnussen‘s McLaren and rejoined down in 15th place. The early stop did work for the reigning champion however, as when Magnussen pitted with Alonso 2 laps later it was Sebastian just in front. Magnussen had lost time after being overtaken by Valtteri Bottas who was now in 4th place. The Finn would unusually fall back behind when he pitted on lap 25 and would have all the work to do again. Race leader Nico Rosberg pitted for his one and only time on lap 25 which allowed Lewis Hamilton to take the lead briefly before his stop on the next lap. Hamilton’s stop was a tenth quicker than Nico’s, but it wasn’t enough to depose him from the lead. Lewis was told to maintain around a 2 second gap to Nico in order to gain from the slipstream but not damage the tyres in the dirty, turbulent air. Lewis however had another plan. The Briton gave it absolutely everything and appeared to be more comfortable on the new tyres. He slashed the gap down by half a second in the middle sector alone and was within the DRS zone of his team-mate as they came down the start/finish straight on lap 29. Nico Rosberg then crucially missed his braking point into the first chicane for the second time in the race. This meant he was slow through the escape road, handing the lead to Hamilton. The lead then increased to over 4 seconds in the next 6 laps. It may have been joy for Hamilton fans, but it was the exact opposite for the fanatical Ferrari fans. The Tifosi were heartbroken when 2010 Italian winner Fernando Alonso pulled his car to a halt at Turn 1 to suffer his first retirement since last year’s Malaysian Grand Prix. He trudged his way back to the pits before receiving a rapturous reception from the fans as he waved from the pit wall. Kevin Magnussen was continuing to hold back Valtteri Bottas. The Dane had received a penalty in the Belgian Grand Prix two weeks ago for apparent ambitious defending. It would be a similar story this weekend after Valtteri was forced to cut the chicane after a robust defence from Kevin. A 5 second penalty would be added to the McLaren driver’s finishing time at the end of the race. A superb battle for 7th was brewing on lap 39 of 53, with former team-mates Jenson Button and Sergio Perez duelling for position. Button pulled off a move up the inside at turn 1, but the Mexican got into his slipstream around the Curva Grande to draw alongside into the Della Roggia chicane. Sergio was forced to bounce slightly across the inside kerbs, but he managed to remain wheel-to-wheel with the 2009 champion through the 1st Lesmo before finally prising the position out of Jenson’s hands into the next turn. Daniel Ricciardo capitalised on the battle between the McLaren and the Force India as he pounced on Button into the 2nd chicane. He then followed it up by a superb ‘dummy’ move on Perez into the same corner on the next lap. The winner of the last two Grand Prix has been one of the stars of the season and was now in 7th place, chasing down Magnussen’s McLaren. He got by Kevin for 6th 4 laps later and then had team-mate Vettel firmly in his sights. He was 2.5 seconds behind Sebastian who was starting to lose grip after his relatively early pit-stop. This was proved on the next lap by the fact that Ricciardo had latched right on to the back of him. He launched himself to the outside of turn 1, but Vettel locked up slightly to retake the place. Daniel had a better exit however and feigned a move to the outside before slamming the car to the inside at Della Roggia. Daring Daniel was rewarded for his spectacular move with 5th place, a superb effort after such a poor start. Back at the front, Hamilton was stroking his car home. The last few Grand Prix had been difficult for Lewis, but this one was much more straight-forward. He lost a few tenths after suffering a massive lock-up at turn 1 with 3 laps to go, but there was hope of a final lap duel between the championship rivals. 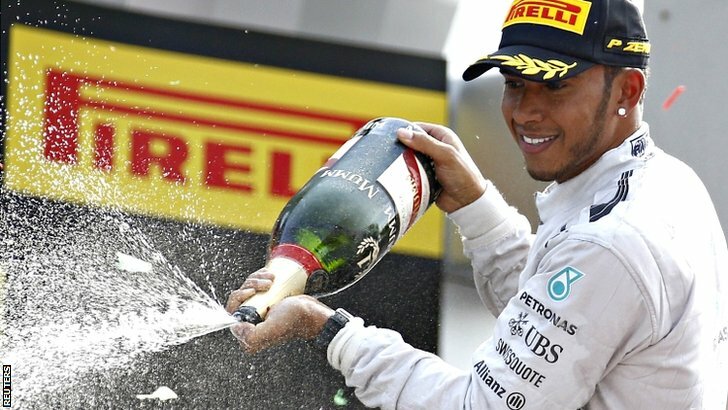 Lewis Hamilton crossed the line 3 seconds ahead of title rival Nico Rosberg to take his first win since his home race at Silverstone in July. With Rosberg finishing 2nd, the gap reduced by 7 points, meaning that Rosberg would still lead the championship by 22 points heading into the Singapore Grand Prix in two weeks time. A quiet but assured race by Felipe Massa landed the former Ferrari driver his first podium since the 2013 Spanish Grand Prix and his first for Williams since leaving Ferrari last year. His team-mate Valtteri Bottas took 4th place after a strong fight back from a poor start. The team-mates continued to come in two-by-two with the Red Bull duo taking 5th and 6th ahead of former team-mates Sergio Perez and Jenson Button. Kimi Raikkonen came home in a disappointing 9th in the only finishing Ferrari, with Kevin Magnussen taking 10th after having crossed the line 7th before his 5 second penalty. Daniil Kvyat finished just outside of the points after starting 21st due to a 10 place grid penalty. The Russian may have finished inside the points had it not been for a scary moment on the penultimate lap into turn 1. The Russian appeared to have lost brakes in his Toro Rosso as he narrowly avoided a high-speed collision with Kimi Raikkonen. The Russian was on full opposite lock as he somehow managed to gather up his car to take 11th place. His team-mate Jean-Eric Vergne took 13th place, with Nico Hulkenberg having his second non-points finish of the year in 12th. Only two drivers failed to finish the race, with Max Chilton joining previously mentioned Fernando Alonso in retirement after hitting the wall on lap 6 at the Della Roggia chicane. Non finishers: Fernando Alonso and Max Chilton. * – 5 second penalty for forcing Valtteri Bottas off track. Nico Rosberg, who finished second: “It’s a terrible feeling to lose the lead like that but in the end Lewis was really quick in the whole race. He came like a rocket and I had to push and I made the mistake. It was really tough, it is still tough now and maybe with the pace he had he would have won anyway, he drove really well and deserved it.